If you’re looking to protect your vehicle with a clear bra, Big Picture Graphics can help. 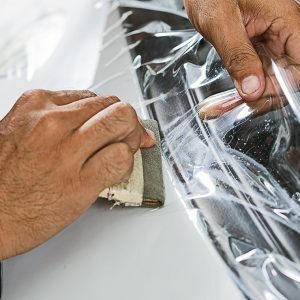 Applying a clear bra can provide protection to the hood, fenders, mirrors, full front bumper, rocker panels, rear trunk, headlights and much more. If you would like to protect the painted surface of your car, truck, van, bus, boat, or motorcycle from road debris, Big Picture Graphics has the solution for you. We hand lay raw material onto full panels, which allows us to wrap the panel’s edges to produce a truly stunning result. Our hand-picked technicians are trained and experienced to provide a diverse range of technical services, and our service consultants represent decades of experience in a wide range of graphic design and vinyl installation. Big Picture Graphics is an expansive, state-of-the-art facility with highly trained, qualified technicians offering customers a one-of-a-kind customer experience. A clear bra is essentially a protective wrap or film for areas of your car that are prone to receive damage. These include the lower fascia, rocker panels, side mirrors, and any surface facing directly toward the front and/or bottom of the car. The main purpose for a clear bra is to protect these areas from road debris that might otherwise leave an unsightly scratch or chip in your paint job. Clear bras also offer protection from any door “dings” resulting from another driver who has parked a little too close to you at the grocery store or mall parking lot. Protection from a clear bra is a wise investment for your personal or business vehicle. It offers long-term protection for those trouble-prone areas, improves the look of your vehicle’s paint job, and increases your car’s resale value. If you want to protect your car’s paint job with a clear bra, give Big Picture Graphics a call today at (720) 881-3988 for a no-obligation, free quote.